Who was Martin Van Buren? Martin Van Buren was the 8th President of the United States of America, the symbolic leader of the country. His presidency began in 1837 and ended in 1841. He was 54 years old when he first began his term of office on March 4, 1837. He was named after his paternal grandfather 'Marten Van Buren' but his mother changed the spelling of his first name from 'Marten' to 'Martin'. He had a variety of nicknames including the American Talleyrand, The Careful Dutchman, The Enchanter, Little Magician, The Great Manager, The Master Spirit, Martin Van Ruin and the Mistletoe Politician. His nicknames reflected his Dutch heritage, his reputation as a wily, devious politician. Red Fox of Kinderhook referred to his hometown and his red-colored whiskers. The picture of Martin Van Buren portrays an interesting image of what this famous man looked like. The picture shows the clothing and the hairstyle that was fashionable during his presidency. He is described as being a small sturdy, dapper man who was 5 feet 6 inches in height which gave rise to the nickname thee "Little Magician". He had sandy colored hair that went gray with age and sported prominent, red-colored whiskers. He was conscious of his image and dressed expensively and elegantly. 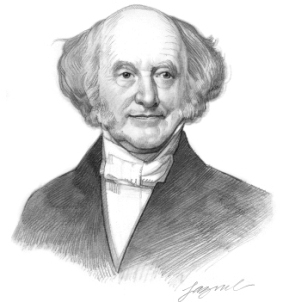 Character and Personality Traits: What was Martin Van Buren like? The personality of Martin Van Buren is described as a charming, engaging man with impeccable manners and a bright, optimistic approach to life. People like Martin Van Buren - and he liked people. His outgoing personality and charm made him a popular man, known for sticking to his morals and principles. He had the ability to hide his own feelings, whilst drawing out the true intentions of his opponents. His nickname the "Red Fox of Kinderhook" referred to his Dutch background and his personality that was as cunning as a fox. The important role and duties of the President of the United States of America include those of Chief of State, Chief Diplomat, Chief Executive, Commander in Chief, Legislative Leader and Leader of his own political party. What was Martin Van Buren famous for? Why was Martin Van Buren important? The history and life of President Martin Van Buren during his presidency is conveyed in the following fact file in an easy question and answer format. What President was Martin Van Buren? He was the 8th President of the United States of America. The dates of his presidency began in 1837 and ended in 1841 (March 4, 1837 to March 3, 1841). What other political offices did Martin Van Buren hold before his presidency? What was Martin Van Buren' nickname? Who was Martin Van Buren' s first lady? Martin Van Buren was famous for the events and accomplishments of his presidency, but what are the facts about the man and his private life. Facts and information about the private life of Martin Van Buren can be found in the following fact file in an easy question and answer format. When and where was Martin Van Buren born? Where was Martin Van Buren educated and what was his religion? What did Martin Van Buren do before he became President of the United States? Who was Martin Van Buren' wife and when did they marry? Did they have kids? We hope that the picture, facts and information on President Martin Van Buren will prove helpful to kids, school children and schools learning about the presidency of this famous American leader. The facts about Martin Van Buren provides an overview of the President's character and personality traits. Watch the video and learn more about the major events of his life and his accomplishments. The following Martin Van Buren video is a useful educational resource for kids, children and schools learning about the life of the US President Martin Van Buren.